Gaetano Genovese (1795–1860) was the chief architect for the royal house of Bourbon in Naples during most of the reign of Ferdinand II (1810-1859), the next-to-last monarch of the Kingdom of Naples (reigning from 1830 until his death). Genovese was born in Eboli, about 70 km (40 miles) south of Naples. He studied architecture at the Royal Academy of Fine Arts in Naples and completed his studies in Rome. In 1824 he was taken on as an assistant architect for the royal house and eventually took the place of the great Tuscan architect, Antonio Niccolini (1772-1850), the person who had restored the San Carlo theater in 1816 after a disastrous fire. Genovese was also a decorator and very much concerned with the interiors of buildings as well as with how they looked from the outside. 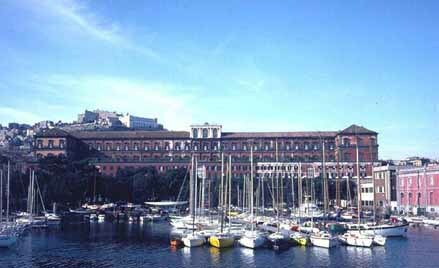 In 1837, the king authorized Genovese to restore the Royal Palace in Naples (located between what is today the large Piazza Plebiscito and the old Maschio Angioino at the port. The San Carlo opera theater is, in fact, built onto the north side of the Royal Palace). Portions of the palace had been destroyed by fire; the restoration was planned to be finished by 1858, but because of political and military events —that is, the threatening invasion from the north that eventually united Italy —work was never completed. Yet, many of Genovese's changes came to fruition. He was conservative and relied at least partially on the plans of the great architect who had designed the original palace in 1600, Domenico Fontana. Genovese was responsible for the neo-Classical design and motifs obvious when you enter the palace from the courtyard and find the magnificent double staircase (photo, left). As well, Genovese removed the remnants of the old vice-royal palace built by the Spanish in the 1500s. (It stood more or less where the San Carlo parking lot is today, which space is adjacent to a small garden called "Giardino Italia," also one of Genovese's ideas. He also redesigned the entire long southern facade of the palace (photo, below) On the inside, Genovese totally rearranged the disposition of private rooms, royal apartments and spaces given over to large gatherings; thus, when you visit the palace today, you are essentially looking at Genovese's vision from the mid-1800s. In 1841 Genovese helped remodel the Villa Pignatelli, still one of the fine examples of neo-Classicism in Italy. Work included building the spaces that today house a coach museum. In 1852 he took a post as a professor of architecture at the Royal Academy of Fine Arts, where he, himself, had studied. In 1853 he became the director of construction at the large Poggioreale cemetery, which included finishing the main church on the grounds.